You can check out one or all of our six traveling pop-up displays for free. They’re easy to assemble and come in six different themes: “Heritage of Our Night Sky,” “Light Pollution and Wildlife,” “Artificial Light at Night and Human Health,” “Lighting and Energy Waste,” “Lighting and Safety,” and “Solutions.” We ship our ever-popular pop-up displays to you for free and only ask that you pay the return postage when shipping them back. We also provide high-resolution PDFs of the displays to download for free, so you can have them printed as displays or posters. To request our traveling pop-up displays please contact Susan Ciarniello at susan@52.10.225.191 or 520-293-3198. 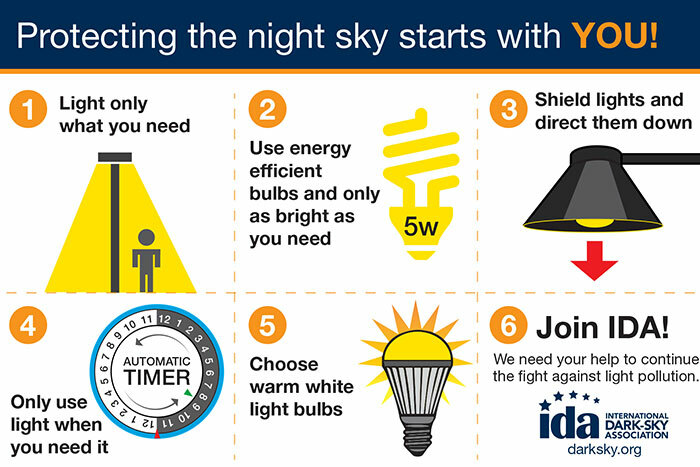 We have an IDA general brochure, five topic-specific brochures, and an IDA “rack card” that you can use to help spread the word about light pollution. 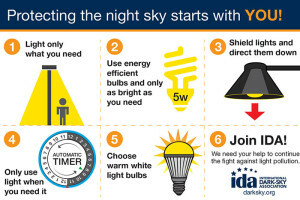 Our IDA general brochure provides an overview of the effects of light pollution and offers suggestions and solutions. 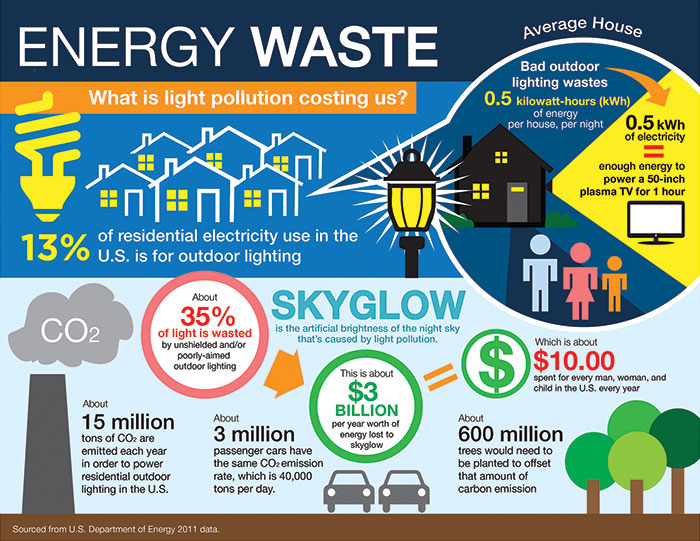 Our other brochures address the more specific impacts of light pollution, including wildlife, safety and security, energy waste, and light at night and human health. We can either send you the printed brochures or you can use the high-resolution PDFs to print them yourself. To request our printed brochures please fill out our brochures request form or you can alternatively contact Susan Ciarniello if you need help at susan@52.10.225.191 or 520-293-3198. To request our traveling pop-up displays or copies of our brochures, please contact Susan Ciarniello at susan@52.10.225.191 or 520-293-3198. 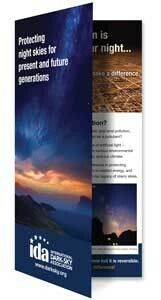 Everybody can do something to stop light pollution and now we have a postcard explaining exactly what YOU can do! The front says “Stop light pollution” and the back has colorful infographics giving people simple solutions to help protect the night sky. 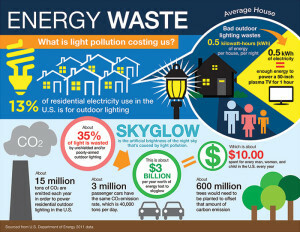 IDA has created a captivating infographic that breaks down the data on the amount of energy and money wasted due to bad lighting in an easy-to-understand manner. Share this image on social media, via email or download and print them out to distribute at your next event. 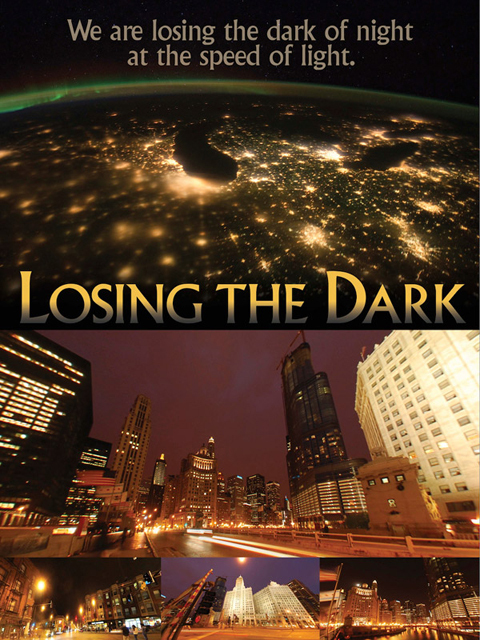 IDA’s “Losing the Dark” is a free informative six-minute introduction to light pollution that can either be streamed online or downloaded onto your computer. You’re free to download and use this excellent and easy-to-understand Intro to Lighting PowerPoint which is an overview of the negative effects of light pollution on society and the environment. Have your neighbors installed lighting that shines on your property and leaves you frustrated? We’ve created a sample letter to your neighbor that may help. Be sure to visit our My Neighbor’s Lighting page, too, for more information and suggestions on how to talk to your neighbors about their lighting. Do you need ideas on how to make a difference in your community? Check out our Get Involved page for a variety of tips and resources, and how you can put these to work. "Losing the Dark" is a joint production of the International Dark-Sky Association and Loch Ness Productions.